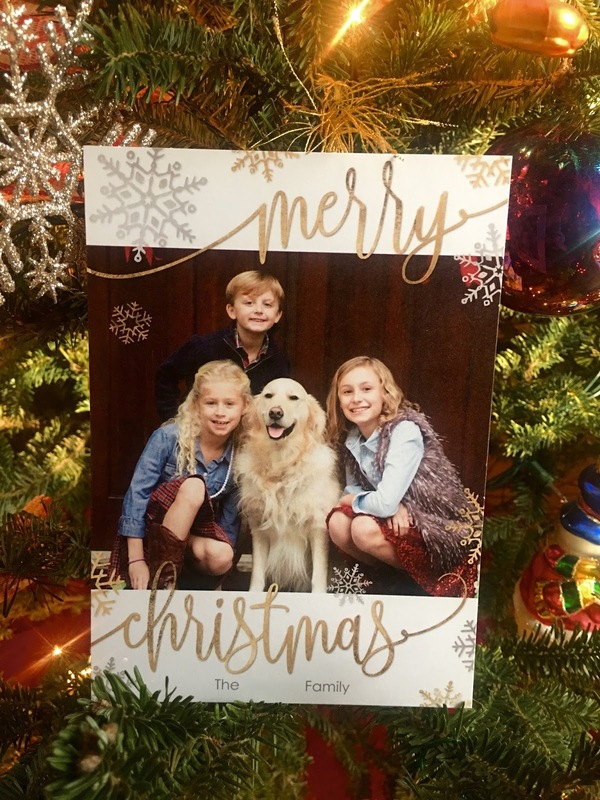 In our house, we love Christmas cards! It's really one of my very favorite Christmas traditions and something we are excited about every single year. 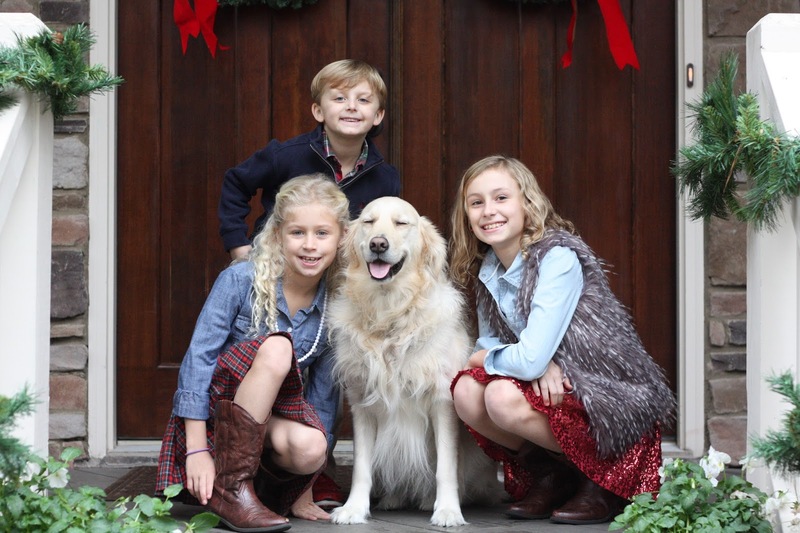 In the past, Jen and I have planned a picture day, planned our outfits, gotten our families together, and taken pictures of each other's families so we have some great Christmas card photos. Well, that was the plan this year until both of our hubbies decided to participate in the no-shave-November challenge at work. I prefer the clean shaven look, so that postponed pictures a few weeks and then we had a hard time coordinating schedules between traveling husbands and kid's activities. That combined with the constant rain we were having had me at the first week of December with no pictures taken, no cards ordered and I was starting to stress out! 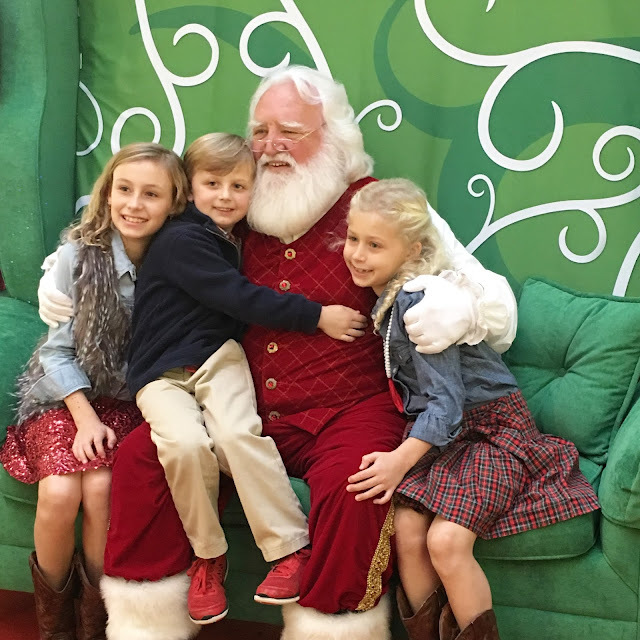 I had one bright spot though...we had plans to dress up for our annual visit to ride the Pink Pig/visit Santa so I knew that might be my only chance of getting the kids all in one place for photo. 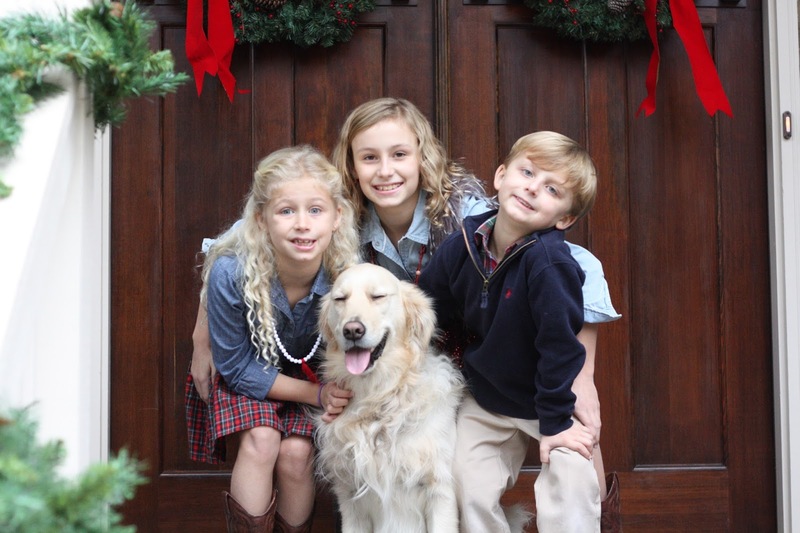 That would have to replace the family photo this year! Thankfully, right before leaving to meet our friends to ride the Pink Pig and see Santa I put them on the porch (it was still raining!) and snapped a few photos. 102 frames to be exact so that I could get this! But, in full disclosure and just to keep things real, I included some of our funny out-takes on the back of the card because #RealLife. Let me tell you, the good thing about waiting until the last minute to order cards is that there are lots of great deals! I have ordered from a lot of different places in the past, but this year price won out! 70% off is hard to beat so I ordered our cards and because I was saving so much I paid for overnight shipping so I could get them to me ASAP. They ended up arriving a day earlier than I was expecting and I couldn't stand to wait so I stayed up late that night to get them addressed and ready to go. Sitting by our Christmas tree, sipping wine and addressing cards to our love ones, both near and far, made for a really special night. 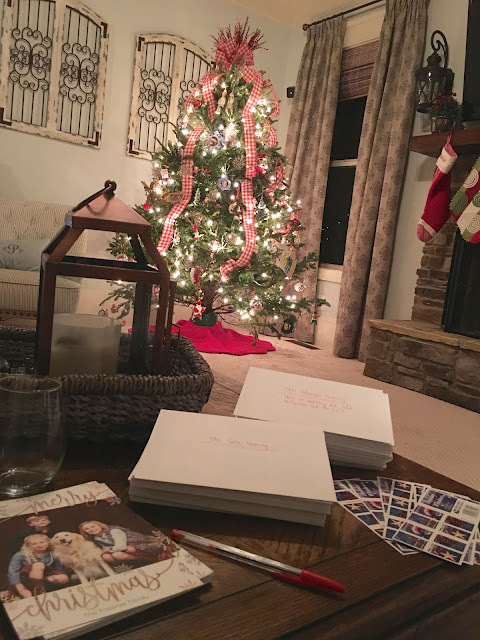 My whole house was quiet because everyone else was asleep, but seeing and writing each name on the 100+ envelopes made me stop and think about how each person or family had come into our lives and made an impact on our family in one way or another. Every day when the mail comes I rush to our mailbox to check for new cards! 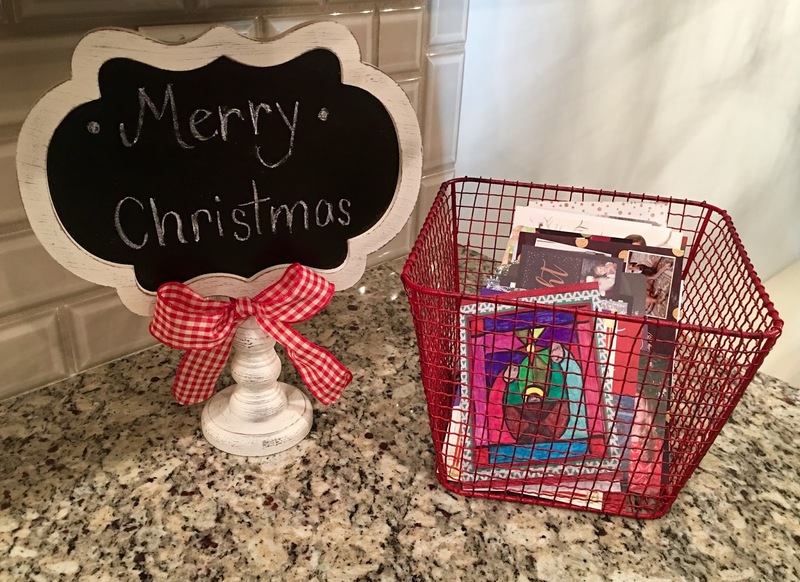 We keep a basket on the kitchen counter and fill it with all of the Christmas cards we receive each day. I love looking through them, the kids love looking through them when they get home from school, and the Mr. comes home from work and loves looking at our new cards each day. 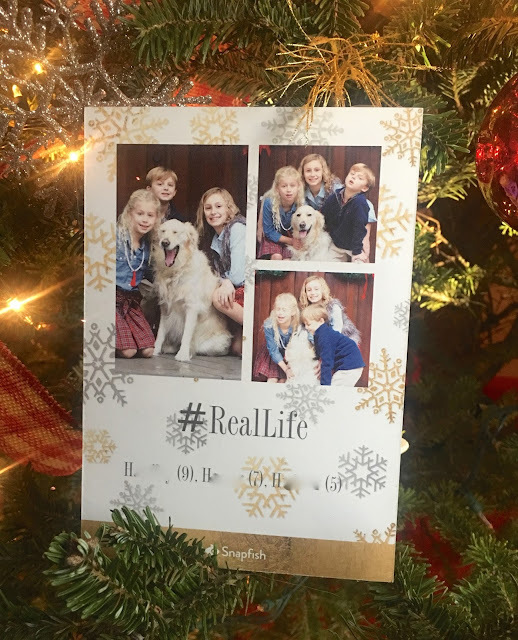 In full disclosure, there were a TON of out-takes to get to the one and only usable photo for our cards, so I thought it would be fun to share some of those funny shots. Walker, our pup, was super excited to be included in the photo shoot. So much so that he was giving kisses every chance he got. 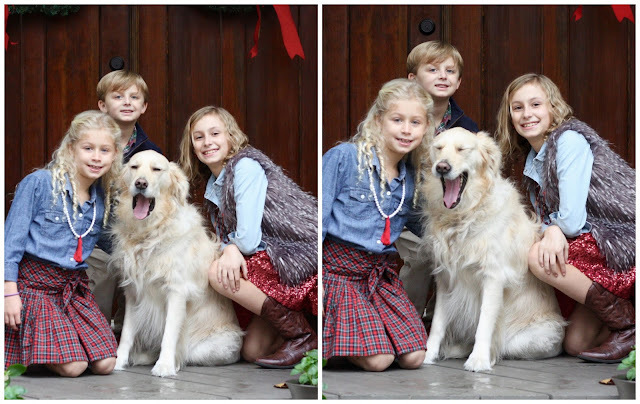 However, when he wasn't giving kisses, he was pretty much over our photo shoot and yawning nonstop. Apparently, we were interrupting his afternoon nap time. I couldn't blame him though. The rainy day had me yawning, too! And if he wasn't yawning, his eyes were closed. I think he was hoping if he closed his eyes we would all just go away so he could continue his nap. 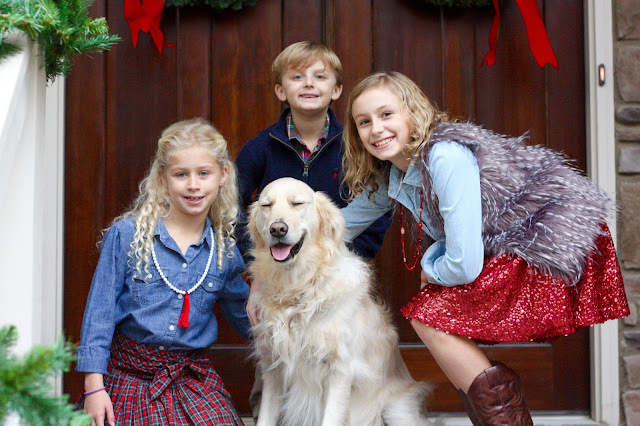 When he was picture ready, the kids were not. Especially Boo-Boo. He looked through the pictures with me the next day and when he saw this next one he commented, "I guess I was really tired in that one." Yep. He was totally thrilled and Blondie, too! 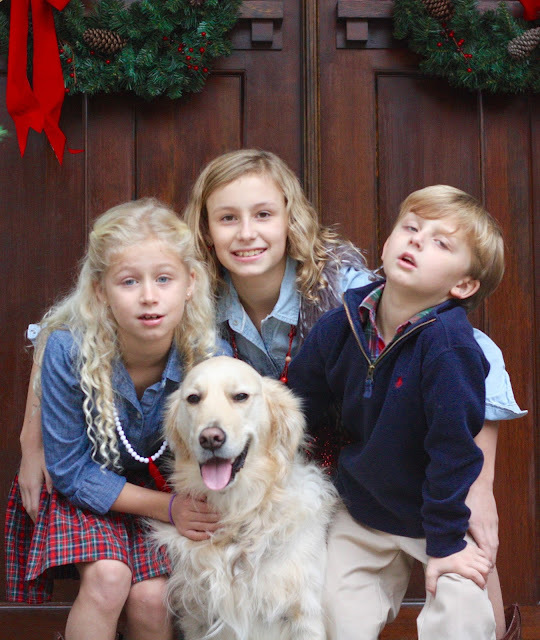 And that, my friends, is pretty much how we all felt about Christmas card photos this year. 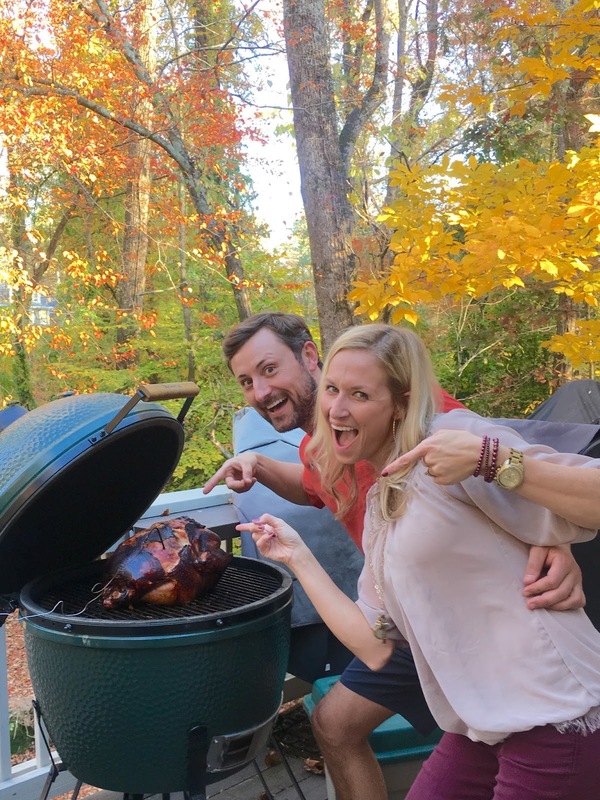 I'm so thankful that I made them take pictures to continue this tradition, but I'm hoping that next year Jen and I have he forethought to do photos ahead of time and not be so rushed at the last minute! We hope everyone has an awesome weekend! Jen's kids are done with school after today and mine have a few more days next week then we are officially on Christmas break!!!! Woo Hoo!! !